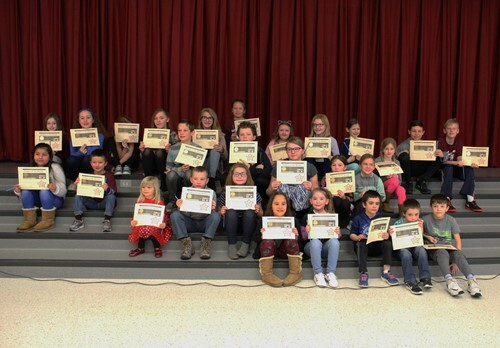 On Thursday, January 24, 2019, the Elementary School assembled to honor the Students of the Month and learn the power of “hello”. After the Students of the Month presentation, the stage curtains parted to reveal a puppet show featuring Mercedes, Carol, and Mr. Broccoli. With the help of students and staff, Merecedes and Carol were able to help Mr. Broccoli understand that just looking and smiling at someone can make a big difference. Then the cast joined in an enthusiastic performance of the song “Say Hello to Your Neighbor” by Marion and Robert Day. As the assembly ended, the Byron-Bergen house band of Mr. Chapman, Mr. Lancia, and Mrs. Tischer performed a jazzy rendition of the Sesame Street theme song - chasing everyone’s clouds away. © 2019. Byron-Bergen Central Schools. All Rights Reserved.